On June 9, 2011, President Obama signed his 86th Executive Order (W signed total of 291). E.O. 13575 will largely impact 16% of the people...the rural population, to be exact. In addition Obama also formed the “White House Rural Council” (WHRC) while everyone was distracted by Weiner's Twitter fiasco. Section One of 13575 states the following. 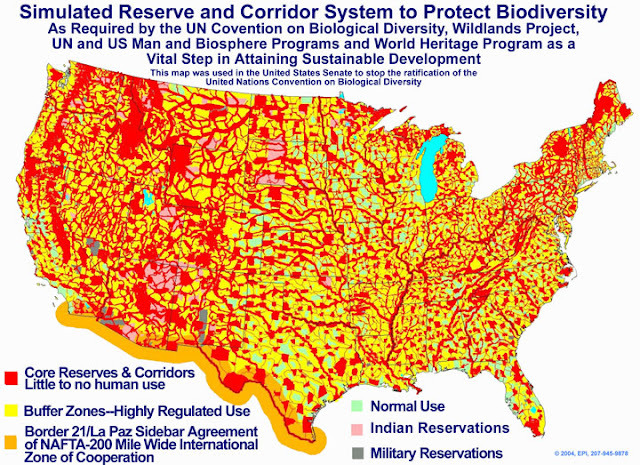 Now, this will raise the red flags of some who are familiar with Agenda 21, a plot to take over the world a United Nations plan for “sustainable development” that was backed by George H.W. Bush and 177 other world leaders. As one person pointed out: 1 + 3 + 5 + 7 + 5 = 21. Agenda 21 proposes an array of actions which are intended to be implemented by every person on earth. … [I]t calls for specific changes in the activities of all people. … Effective execution of Agenda 21 will require a profound reorientation of all humans, unlike anything the world has ever experienced.- One of the agenda's planners at the Earth Summit Strategy to Save Our Planet. I have no idea as to the authenticity of this map. Supposedly, it was presented to the US Senate to stop the "biodiversity" agenda of the UN. If nothing else it's fun to see whether you may stand in the way of the system to protect the the piping plover and the pallid sturgeon .